While some software updates tweak a setting or optimize a few lines of code, some radically change the functionality of the system. Take, for example, the Nvidia's Shield Experience Upgrade 3.2 update coming to the Nvidia Shield that will integrate Plex functionality directly into Android TV. 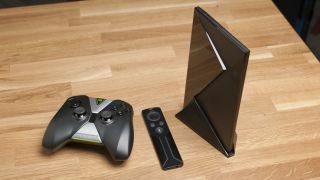 Nvidia Shield already won the majority of home entertainment enthusiasts' hearts when it launched as the first 4K streaming video player back in 2015. But that love is going to turn into a downright obsession now that Nvidia's little console can act as a full home theater PC (HTPC). Plex, for those who don't know about it, is a sort of media management system that keeps tabs on your movie and TV files that you've downloaded or ripped from DVDs and stores them on a local server. Once it's cached, you can stream the film from your device to any other system running a Plex client – i.e. any mobile device running iOS, Android, Windows Phone or Windows 8, as well as a stable of set-top boxes that include any Android TV platform, most smart TVs, the new Apple TV, Amazon Fire TV, Chromecast,Ouya, Roku, Xbox 360, Xbox One, Playstation 3 and Playstation 4. While Plex clients take every shape and form, it wasn't until this update that you could turn your Nvidia Shield into a Plex server – a privilege that has typically been reserved for massive HTPCs. Now, one limiting factor of using the Nvidia Shield as your entertainment storage center is that the cheapest units, the ones that cost $199 (around £130, AU$255), only came with 16GB of memory – i.e. not a lot of space for storing tons of movies. That could be remedied by shelling out for the larger size hard drive (Nvidia Shield also comes in a 500GB version) or slotting in a microSD card for an additional 256GB of space. So when can you start loading up your new mini-HTPC? The Plex Media Server functionality will be included in Nvidia's Shield Experience Upgrade 3.2, which should be coming along any day now.